Enter your dates to pick from 228 hotels and other places to stay! Set in Paramaribo, 1.1 mi from Paramaribo Central Market, Q-Inn Boutique Hotel features free WiFi access and free private parking. Guests can enjoy some cocktails in the on-site bar with a terrace. The owner Ron Ron’s entrepreneurial spirit and passion came through in his staff as well. 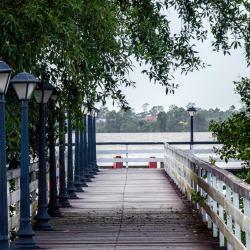 Ramada Paramaribo Princess offers an Entertainment Center, the famous rooftop in Suriname, a Japanese restaurant and free WiFi access. The breakfast was delicious. The hotel was amazing. It's located right in the heart of a tourist area. You can feel safe here. Located in the city center, Hotel Palacio offers free WiFi and buffet breakfast in Paramaribo. The central market, Independencia square, and Zeelandia Fort are 656 feet away. Friendly, helpful staff. Close proximity to everything, eating places, shopping and site seeing. Clean, cozy and comfy room. Featuring a terrace, a swimming pool and a fitness center, Courtyard Paramaribo offers rooms with free cable TV only a 10-minute walk from the Palm Tree Garden. The property and the hotel are fine. However, when I inquired about their rates I found out that it would have been cheaper if I have called the hotel directly and made my own reservation. I got unhappy with the deal I got through Bookings.com. Overbridge River Resort has a private beach area and free WiFi. Providing a restaurant, the property also has an outdoor swimming pool and a garden. The beds were comfy, great pool, friendly staff that just do that bit more to meet your satisfaction. Offering free WiFi, Waterland Suites is located in Paramaribo. Featuring a garden, this 3-star hotel has air-conditioned rooms with a private bathroom. Large, newly redecorated, room. Located a 10-minute walk from Paramaribo Central Market, La Petite Maison in Paramaribo features a terrace. The property is around 300 yards from Waterkant, a 10-minute walk from St. I had a winderful time. The staff is excellent, lovely and caring. They make you feel at home. Offering an outdoor pool and a restaurant, The Golden Truly Hotel & Casino is located in Paramaribo. It’s located just 2.5 mi from the city center and features a fully equipped casino. The staff was amazing. The beds were always covered with clean sheets,the staff were always ready to assist In any way possible. 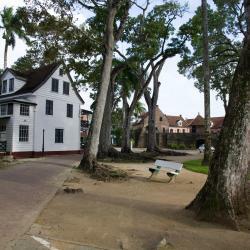 Located 1640 feet from the historic center and a 20-minute walk from the financial and commercial area, Eco Resort Inn features an outdoor swimming pool, a garden and a restaurant in Paramaribo. Clean room, good bead, hot wayer, breakfast bar good and wonderful staff. 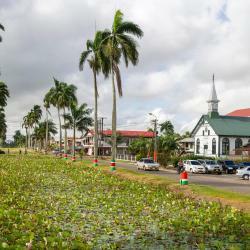 Maretraite Hotel is offering accommodations in Paramaribo. 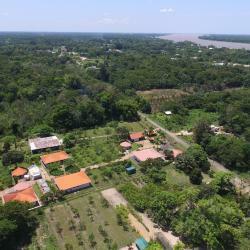 The property is located 2.4 miles from Paramaribo Central Market and 2.1 miles from Waterkant. A 7-minute walk from Paramaribo Central Market, Midnight Hotel is located in Paramaribo and provides air-conditioned rooms.